If you notice something unusual floating in the sky tonight, don’t fear the apocalypse or impending doom, but do relax and take in a marvelous sight. This evening, a harvest moon will rise in the eastern sky and combine with a lunar eclipse, giving you a final chance to view the phenomenon until it returns again in 2024. “Harvest Moon” is a longstanding pop-cultural trope -- notably coming to fame in various musical forms, like this 1992 Neil Young album -- but its origins lie in America’s agricultural past: It refers to the time period when electricity was scant in rural areas, and moonlight was crucial to farmers, who had to harvest their crops with any light available. In scientific parlance, a harvest moon refers to the full moon closest to the autumnal equinox, the time when farmers did the majority of their harvesting, according to CNET. This particular harvest moon is special because of the penumbral lunar eclipse happening across certain parts of the Earth tonight. When this happens, the moon slides through the earth’s shadow, making it less bright than usual. According to EclipseWise, this will be visible in Europe, Asia, Africa and Australia. 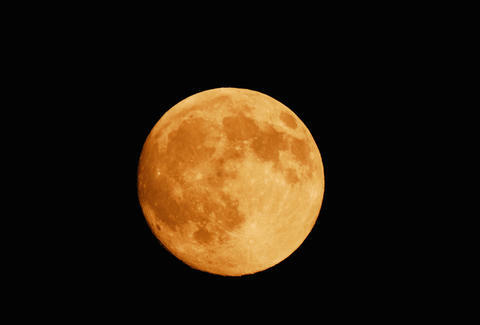 The harvest moon should appear bigger than normal, and may have a luminescent orange tint covering the surface, as opposed to its usual waxy, white glow. Either way, be aware when you’re out tonight, it should be a visual feast -- and you won’t see it again for eight years.